Last month I wrote a post about something terribly serious, possibly jaw dropping and gasp inducing. Remember the Dishwasher Dilemma? I was rather surprised by the interest and conviction expressed over separating your silverware vs. a more willy-nilly approach. I was quite tickled. Turns out, many of you are like me and just toss the silverware into the caddy, some are even more like me in that the majority of your cutlery can be found in the first few spots because you don't like to open the door all the way. Others showed obvious distress that tossing willy-nilly is even an option. Your caddy is organized and neat, like utensils grouped together ready to be easily unloaded back into the drawer. In the willy-nilly camp there was relief that the dishes and silverware were even IN the dishwasher, however they are arranged. There was also concern expressed over the fate of the segregated spoons. Would they nestle together and not get cleaned? The horror! The segregated camp sang the praises of organization and time saved by grouping their silverware. Makes sense. (Did someone whisper OCD?) I think we all agreed that dishwashers (the automatic and human powered kinds) make our lives easier, no matter how we load them. Now I have another question to pose to you, my dear bloggy friends, brace yourselves. Do you make your bed every day? Every. Single. Day? 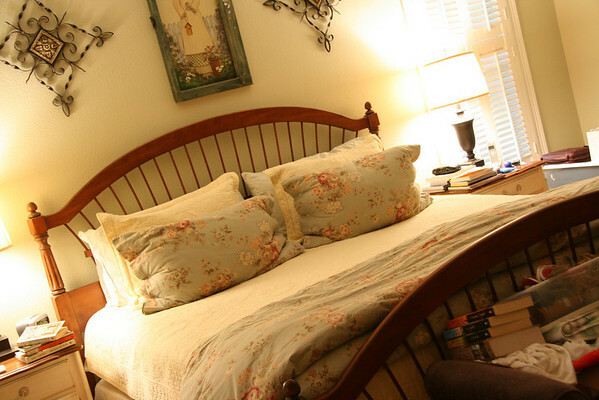 Even though our nightstands might be cluttered, and okay...a little dusty, and the bench at the foot of our bed is really nothing but a clutter magnet, our bed gets made each morning. On rare occasions it might not get made, those days always make me feel slovenly and out of sorts. Making the bed gives me a sniglet of peace, an assurance that in relation to other housekeeping negligence that may or may not be evident, at least I've made the bed. Small, daily victories, right? No, I do not make my bed every day. I spent the time I could be using to make my bed yelling at my kids to make their beds. Then I close my bedroom door and go to work. GREAT post idea. NOW, you're going to see some passion. YES!!! Every single morning. The very idea of missing a day disgusts me. If it is not made past 10, I go into panic mode. My children must all make their beds before school as well. Not an option to do otherwise. And in case you think this is something I grew up with, it's not. It's self-taught. I was never required to make my bed. I saw the light in my adulthood and I'm born again! So, no excuses peeps. Beds should be made without fail. Yep, I'm a little passionate about this subject. Can't wait to see all the responses. I still don't understand how all the spoons get cleaned if they're in the same section of the dishwasher caddy, how could they NOT spoon with each other? I am a daily bed maker for sure. I feel completely out of sorts and slovenly if it is not made, even if our nightstands are a mess. It seems rather filthy not to make the bed each day, plus it seems like it would take away the pleasure of getting into cool sheets every night. I do make my bed EVEry Day- top sign of a really bad day is an unmade bed. Our bed gets made everytime I...change the sheets. And blieve me, I don't change those everyday! Nightstands...total mess. But, it's all books so, who cares? The only time my bed gets made up is on Wednesday when my cleaning lady comes.. I NEVER make it. I grew up with a Mom who would not let you leave the house unless your bed was made. yes. making the bed is a must. but not in the morning, silly. who has time while they're running around trying to get ready in a hurry as to not be late... and not to mention the sleepy factor. as long as it gets made before you actually go to bed again, it's a good day. I usually make my bed in the afternoon after I get home from work. it's my belief that your room can be a total disaster area, but as long as your bed is made things look a heck of a lot cleaner. I only make it if my mom or MIL is coming over! Nope, I NEVER make my bed until recently I never had a reason to do it b/c my husband worked nights so I got out of the bed and he got in so I'm not a bed maker~every once in a while when I'm cleaning house but not on a daily basis! I keep trying to keep the old saying in my head..."Tidiness begets tidiness"
You have a beautiful bed, by the way! I HAVE to make my bed! It doesn't always happen very first thing (although that is my preference) but 99% of the time my bed is made...if not, there is a problem. LOVE your "homemaking" posts and reading all the comments! I've been enjoying your comments! I hope I'm not setting Annelise up to hate making her bed in the future, but I do expect her to make it now. It just makes things look a bit more together even if there are toys spread across her floor. I'm still worried about those spons nestling together and not getting clean too. Mine is made every morning. Then, when I walk back into my room or pass the door (our master bedroom is downstairs near the kitchen) I feel like I've accomplished something. I agree that if it never gets made I feel more slovenly. Good word! I'm not as good at getting my boys to make theirs. I need to be better about that. I found that they stole some of mine as well and thought you should know.